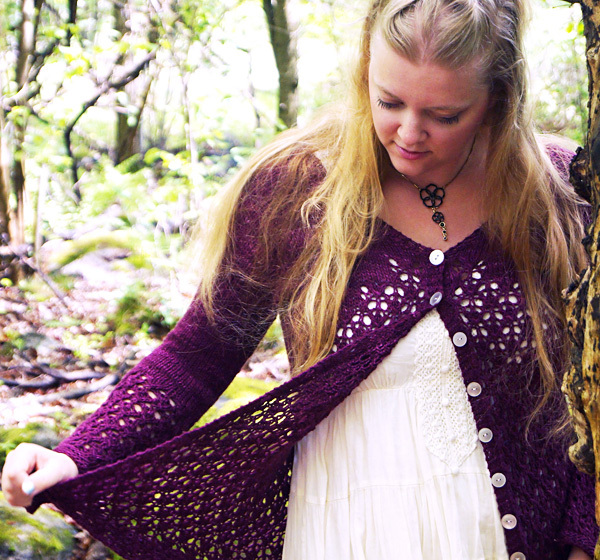 The lace pattern is introduced while still working the yoke, and initially requires some extra attention -- this soon turns into smooth sailing, and a project you don't want to put away. A treat for the experienced, or a wonderful challenge for the advanced beginner! Note: buy buttons after project is complete to ensure a good fit. Row 1: K1, yo, ssk, k1, k2tog, yo, k1. Row 2 (and all WS rows): Purl. Row 3: K1, yo, k1, sk2p, k1, yo, k1. Row 5: K1, k2tog,yo, k1, yo, ssk, k1. Row 7: K2tog, k1, yo, k1, yo, k1, ssk. Row 1: K1, [yo, ssk, k1, k2tog, yo, k1]. Row 3: K1, [yo, k1, sk2p, k1, yo, k1]. Row 5: K1, [k2tog, yo, k1, yo, ssk, k1]. Row 7: K2tog, [k1, yo, k1, yo, k1, sk2p] to last 5 sts, k1, yo, k1, yo, k1, ssk. Rnd 1: K1, [yo, ssk, k1, k2tog, yo, k1]. Rnd 2 (and all even rnds): Knit. Rnd 3: K1, [yo, k1, sk2p, k1, yo, k1]. Rnd 5: K1, [k2tog, yo, k1, yo, ssk, k1]. Rnd 7: K2tog, [k1, yo, k1, yo, k1, sk2p] to last 5 sts, k1, yo, k1, yo, k1, ssk. Work Buttonhole: [k1, yo, ssk, k1] over the last 4 sts of a row. Garter Stitch (flat): Knit all rows. CO 39[41, 45, 47, 53, 55, 57] sts. Set-Up Row [WS]: K3, pm, k5[5, 5, 5, 7, 7, 7] sts, pm, k23[25, 29, 31, 33, 35, 37] sts, pm, k5[5, 5, 5, 7, 7, 7] sts, pm, k3. Next Row [and all WS rows until otherwise specified]: K4, purl to last 4 sts, k4. 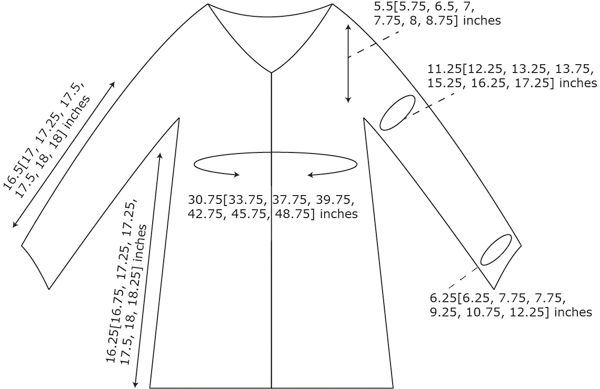 Note: Work Buttonhole at the end of every 10th row until the desired number of buttonholes has been reached. No further mention of buttonholes will be made. 169[181, 205, 217, -, -, -] sts: 26[28, 32, 34, -, -, -] sts on each Front, 33[35, 39, 41, -, -, -] sts on each Sleeve, 51[55, 63, 67, -, -, -] sts on Back. Begin Divide. Rep the last 2 rows -[-, -, -, 1, 1, 2] more time(s), keeping Lace correct. -[-, -, -, 241, 253, 273] sts: -[-, -, -, 37, 39, 42] sts on each Front, -[-, -, -, 47, 49, 53] sts on each Sleeve, -[-, -, -, 73, 77, 83] sts on Back. Begin Divide. Note: From this point on, incorporate a new rep of Krydda Lace every 8th row to end. Next Row [RS]: Keeping Krydda Lace correct, work up to m, rm, place the foll 33[35, 39, 41, 47, 49, 53] sts on hold for Sleeves, CO 5[6, 6, 6, 6, 7, 7] sts, place side marker, CO 5[6, 6, 6, 6, 7, 7] sts, rm, work across Back, rm, place the foll 33[35, 39, 41, 47, 49, 53] sts on hold for Sleeves, CO 5[6, 6, 6, 6, 7, 7] sts, place side marker, CO 5[6, 6, 6, 6, 7, 7] sts, rm, work to end. 123[135, 151, 159, 171, 183, 195] sts: 31[34, 38, 40, 43, 46, 49] sts on each Front, 61[67, 75, 79, 85, 91, 97] sts on Back. Work 3 rows even, keeping Krydda Lace correct and incorporating any repeats as required. SR1 (RS): K to marker, sm, k to 1 st before side marker, w&t. SR2 (WS): P to 1 stitch before side marker, w&t. SR3: K to 5 sts before wrapped st, w&t. SR4: P to 5 sts before wrapped st, w&t. SRs 5-8: Rep SR3-4 twice more. SR9: K all sts, working each wrapped st with its wrap. SR10: K4, p to last 4 sts, removing side markers and working each wrapped st with its wrap, k4. Cont working even in patt, incorporating one new rep of Krydda Lace when required, until Body meas approximately 15.5[16, 16.5, 16.5, 16.75, 17.25, 17.5] inches from armhole, or until 0.75 inches before desired length, ending with Krydda Lace Row 8. Continue working even in stockinette until the sleeve measures 8.5[9, 9.25, 9.5, 9.5, 10, 10] inches from armhole, or approximately 8 inches before desired length. 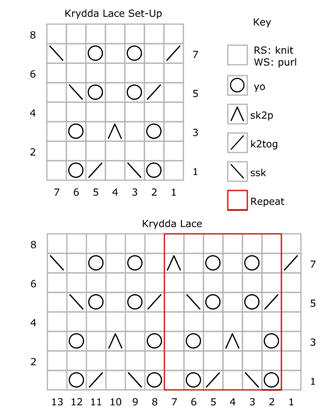 Begin working Krydda Lace across all sts, until 5 full patt reps are complete. Work 4 rnds in Garter Stitch. Block to measurements according to yarn instructions. Attach button(s) opposite button hole(s). 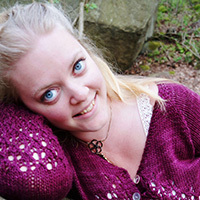 Madeleine Nilsson has only been knitting for a couple of years, but has already mastered the true art of yarn addiction. She started designing knitwear in late 2011, and has finally found that necessary creative outlet that she's been searching for. 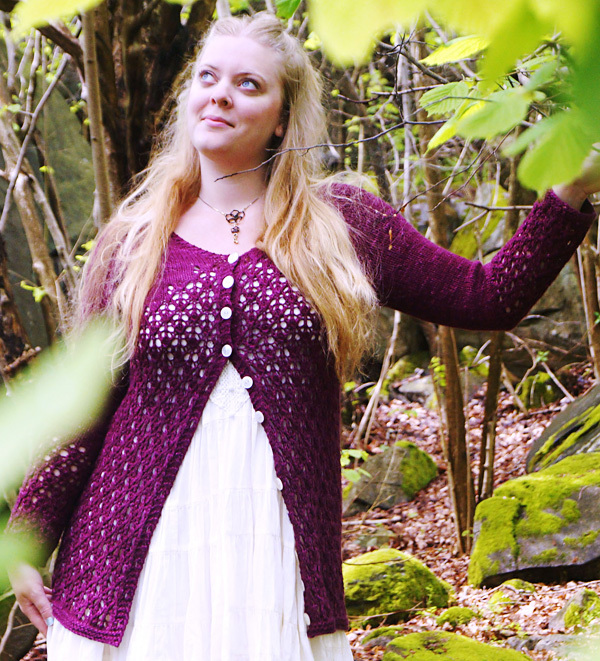 The process from idea to finished piece is immensely gratifying, and she often finds herself playing around with construction in her quest for new garment ideas that are a pleasure to both knit and wear. 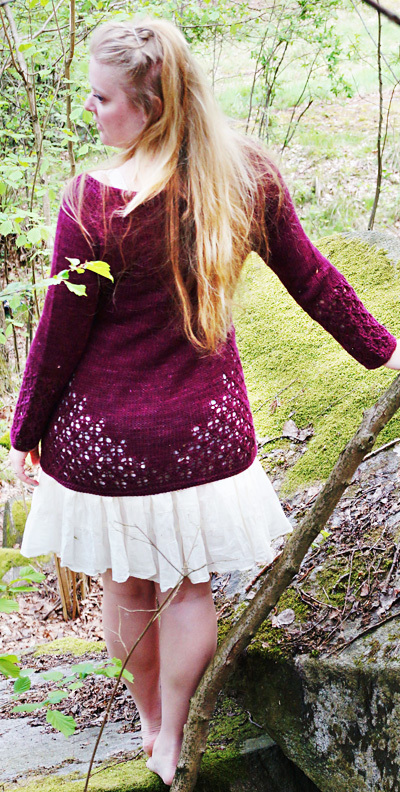 Madeleine lives in Sweden with her husband, and blogs about her crafting here.